Members of the Murphy Historical Society volunteered at the “Cotton from Farm to Market” event. (Front) Debbi Brumit (Back row, from left) Donna Jenkins, Lolisa Laenger, Gwen Durrant and Mike Hendrix. Sept. 22, 2018 – Members of the Tri-Cities (Murphy, Sachse, Wylie) Historical Societies Coalition hosted “Cotton from Farm to Market” at the Sachse Historical Society Museum. Attendees participated in multiple interactive stations where members of the North Texas Civilian Historians told about the time period they represented, demonstrated how day-to-day tasks were done in the 1800s and invited those interested to try doing that task. In addition to the educational stations, there were photo opportunities, live musical entertainment and story times. Donna Jenkins, president of the Murphy Historical Society said that this event originated during one of their tri-city meetings. “Diana Smith from Sachse discussed the idea of a joint event about how important cotton once was to our communities. Eventually, the idea formed to include the importance of transportation to the cotton farmers and the communities.” This was the first event held by the Tri-Cities Historical Societies Coalition. Colby Young follows directions on proper weaving techniques. The group received a grant for $600 from Collin County Historical Commission at Jenkins’ request. The funds were used in a variety of ways: Enlarge historical photos, purchase cotton cards, cotton seeds, sacks for the sack races, promotional flyers, banners and refreshments. Jenkins said they used all of the grant money and more. Additional costs will be divided among the historical societies. 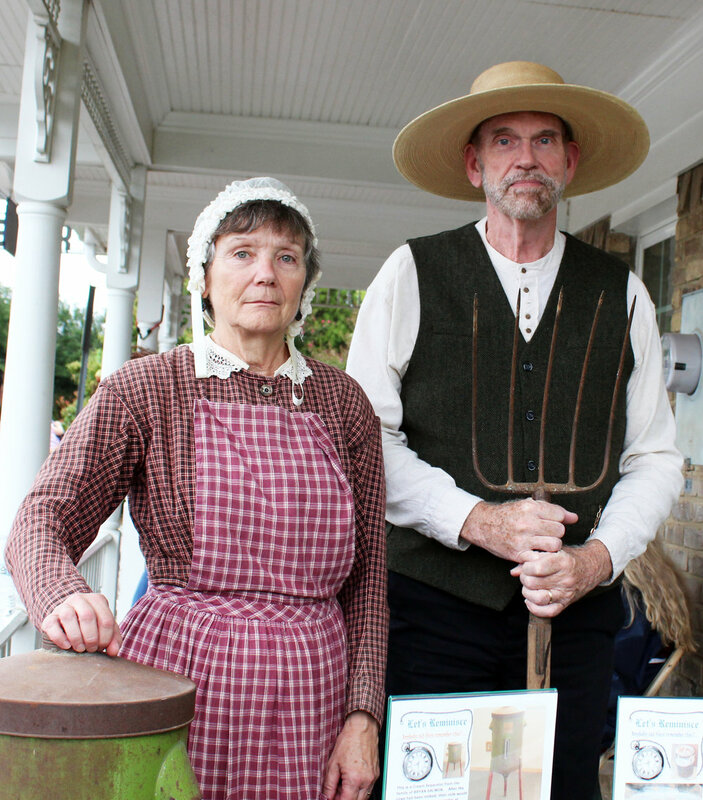 Tom Leach and Becky Clemens chose not to smile for this photo to reflect the time period they represented and the limitations that daguerreotype photos presented.